Screening of Patients at Risk for Familial Pancreatic Cancer: What Is Beneficial? Timing of Pancreatic Resection and Patient Outcomes: Is There a Difference? Adjuvant or Neoadjuvant Therapy in the Treatment in Pancreatic Malignancies: Where Are We? Nonfunctioning Incidental Pancreatic Neuroendocrine Tumors: Who, When, and How to Treat? 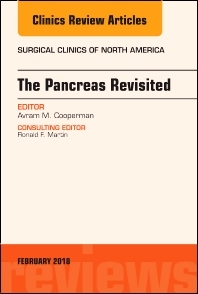 This issue of Surgical Clinics of North America focuses on Management of Pancreatic Cancer, and is edited by Dr. Avram Cooperman. Articles will include: Is preclinical diagnosis / or prevention of cancer of the pancreas be possible? ; Preoperative evaluation of a pancreas mass: diagnostic options; Clinical evaluation of a pancreatic mass: what is essential and practical from a therapeutic standpoint? ; Screening of patients at risk for familial pancreatic cancer— what is beneﬁcial? ; Incidental IPMN, cystic /premalignant lesions of the pancreas: the case for selective, conservative management; Preoperative stenting for benign and malignant periampullary cancer: the case for selective application; Preoperative stenting for benign and malignant periampullary diseases: unnecessary if not harmful? ; Timing of pancreatic resection and patient outcomes: is there a difference? ; Outcome analysis for pancreatic surgery: actual vs actuarial methods? ; The role of radiation in pancreatic cancer: the European and American view; Adjuvant or neoadjuvant therapy in the treatment in pancreatic malignancies: Where are we? ; Nonoperative Ablation of Pancreatic Neoplasms; Incidental IPMN, cystic/ premalignant lesions of the pancreas: The case for aggressive management; Ex Vivo surgery for low grade tumors involving celiac and superior mesenteric arteries; and more!